It has been a rough week so far, going 2-2-1. I pushed Seattle, won with Washington State and the Saints, lost with the Chargers and Vikings. Though, since all my bets were for virtually the same amount, all I have lost is the “juice” on the bets. As I stated on The Monster Podcast with Chad Harberts Thursday, I still think the line is too high in the Chiefs-Rams game tonight on Monday Night Football. It is down 1/2 point from 64 to 63.5. I suspect some under bets to drive it down a little more but at this point I don’t see it going less than 62.5. It will probably settle at 63. Californians in Las Vegas betting the over will keep it pretty steady. I put my money where my mouth is, as always. 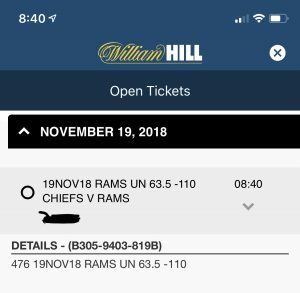 Chiefs-Rams under 63.5. The Chiefs defense is stronger now than it was earlier in the season. Both teams can run the ball. It will be close, but I believe the under is the right play.